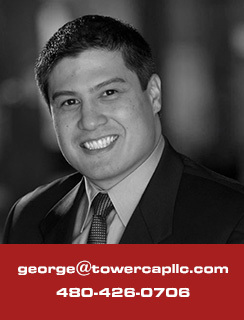 George Maravilla spearheads Tower Capital’s Equity and Development platform. Prior to joining Tower Capital, George spent 14 years at DMB Associates, Inc., a renowned real estate development firm, where he most recently served as Director of Finance. The company specializes in large scale master planned communities, golf courses, multifamily, office, retail and mixed-use projects throughout Arizona, California, Hawaii, and Utah. At DMB he was responsible for managing project level financial risk and created sophisticated financial models that were utilized to establish the appropriate development strategy. He also created long-term capital plans, project life cycle capitalization, deal structuring, and was in charge of investor/partner reporting. Furthermore, he evaluated new opportunities in a wide range of residential and commercial asset classes having underwritten more than $700M in potential acquisitions and vertical developments during his time at DMB. Prior to DMB, George was in technology doing Financing Planning & Analysis for companies including Yahoo!, Excite@Home and Plantronics. George is actively involved with the Urban Land Institute (ULI) and National Association of Industrial and Office Properties (NAIOP). He graduated with a degree in Accounting from Arizona State University with an emphasis in computer information systems and philosophy.